DUBAI, UAE- WINDIES Women suffered a 2-1 series defeat to Pakistan in Round 4 of the ICC Women’s Championship, One Day International series at the ICC Academy Ground in Dubai. Pakistan pulled off a nail-biting win by 4 wickets with 2.4 overs to spare, to finish on 163/6, as they successfully chased the small WINDIES total of 159 all out from 47.3 overs. The WINDIES Women won the toss and elected to bat first on a very grassy pitch. Kycia Knight once again departed without scoring, as Diana Baig bowled her on the third delivery she faced. Stafanie Taylor joined Deandra Dottin and the pair looked set to take the WINDIES Women to a bug total. Dottin again was in exceptional form stroking the ball confidently. She smashed a huge six straight back over the bowler and onto the flagpole in the distance. However, charging after a non-existent single from the non-striker’s end, she was well short of her ground and runout for 28. Taylor once again had to rebuild the innings, this time joined by Shemaine Campbelle. The pair were quick between the wickets, taking the singles and twos that Pakistan missed. Campbell end Taylor built a scoring momentum, using the flight of the ball against the Pakistan bowlers. The WINDIES scored the fastest in this match in their opening 15 overs, reaching 75 runs. Campbelle was the first to fall from this partnership, as she needlessly charged down the pitch at Nashra Sandhu and was stumped for 26. Taylor played a captain’s knock to save the innings. After Campbelle’s departure, no other player offered a partnership with Taylor. The skipper struck her 34th half-century as the WINDIES women fought to get to a defendable total. With the pressure to score, Taylor going for a pull shot, got a top edge and was caught and bowled by Diana Baig for 52. Afy Fletcher was the only other WINDIES batter to reach double figures. 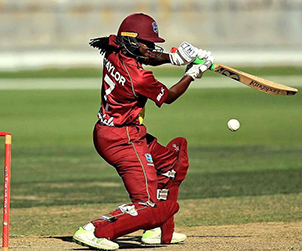 She remained on 21 not out, as the WINDIES Women were all out for 159 in 47.4 overs. Nashra Sandhu had the best bowling figures for Pakistan, taking 3/21 and Diana Baig with 3/42. Sidra Amin continued the batting she did in the second ODI. She frustrated the WINDIES bowlers once again, as she picked off the singles and twos. Chasing such a small target it was easy cruising for Pakistan, as they took no risky shots. However, some very economical bowling from Stafanie Taylor and debutant Karishma Ramharack in the middle overs, saw the WINDIES bowlers sway the match back in their favour. Shamilia Connell and Shakera Selman had solid opening spells, which the slow bowlers maintained throughout the innings. Only at the very end did the bowling become a bit untidy, as Dottin, Selman and Connell bowled a few wide deliveries. Pakistan lost their nerve in the last 15 overs, as the batters were outplayed by the WINDIES bowlers. They lost 3 quick wickets of Sidra Amin for 52, Nida Dar for 26 and Aliya Riaz for 5. With this, the WINDIES thought they had a sure chance, but new batter Kianat Imtiaz was dropped by Taylor at first slip. Sana Mir eventually went on to hit the winning run which came via a boundary off Dottin. Pakistan 163/6 in 47.2 overs. Sidra Amin 52, Nida Dar 26, Javeria Khan 24. Stafanie Taylor had the best bowling figures for the WINDIES Women with 2/17 followed by Shakera Selman with 2/24. Sidra Amin was Player of the Match and the Pakistan Player of the Series, while Stafanie Taylor was the WINDIES Player of the Series for 158 runs and 3 wickets. Pakistan now move ahead of the WINDIES Women in the ICC Women’s Championship Table to 4th with 12 points, the WINDIES Women now have 11 points in 5th place, 1 point ahead of England in 6th.